Mr & Mrs Derry were well liked by Managers and Parents [ but see also Note 21b ]; they had excellent reports from the Diocesan Inspectors who came yearly and, at first, good annual reports from HMIs. Post war [ WWI of course ] reports tended to be more critical of teaching methods used in the school, but this was a period of countrywide change in education and the HMIs tried to implement the changes. e.g. 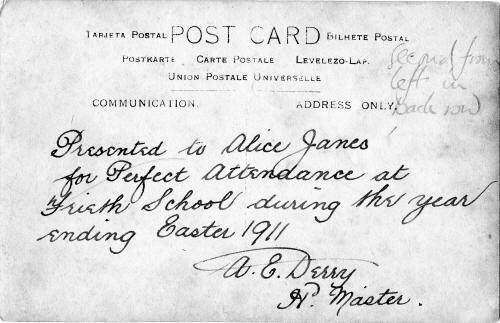 Phonics were introduced into the teaching of reading, a new Physical Training syllabus was printed, a round script form of writing was favoured instead of cursive (looped). The names of Standard I, II etc. (Note 19) were being dropped and the children grouped in classes. The syllabus for the over 11 year olds was being widened to include technical subjects and selection at 11 years through a competitive examination for free and assisted Grammar School places was introduced (Note 20). Unlike his predecessor, Mr Derry was not a keen sportsman, although he did take football/cricket practice (on Saturdays?). Mr & Mrs Derry were ardent in church work and observance. On Sundays Mr Derry took Sunday School in the schoolroom from 10:00 - 10:30, read a 'suitable' story to the children from 10:30 - 11:00 and then marched them into church from 11:00 - 12:00 unless they produced a written note from their parents to the contrary! Sunday School prizes were given yearly, for good attendance, presumably these were provided by the Church or philanthropic parishioners. 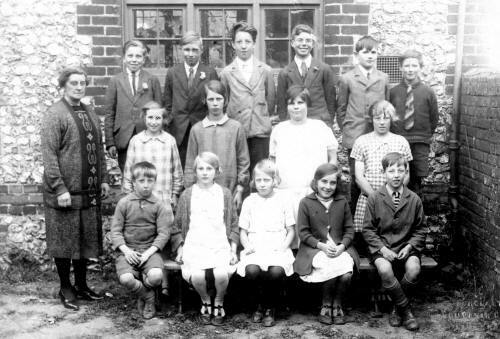 Good attendance at school was rewarded by having one's photo taken in a summer group. The pupil's mother was given a copy to keep. A member of the Cripps family usually distributed these prizes at an annual prize-giving in July and Squire Cripps continued to provide a yearly Christmas Party, first at Parmoor, and later in the Village Hall on Boxing Day, when the schoolmaster ran it. As can be seen from the preceding paragraphs, up to this period the village schoolmaster was still expected to work six days a week. School teachers nowadays put in many more than the 9am to 4pm hours they are actually in school but this is on a voluntary basis. Both Mr & Mrs Derry were strict disciplinarians but as one 'old pupil' 1910-24 said : "He used to cane us boys, but we deserved it." (Note 21 [and 21a] ) During the 21 years Mr Derry was headmaster there are only three recorded instances of parents who objected to their children being punished [Note 21b]. Mr Derry was obviously interested in singing and dramatics. He organised a concert of some sort most years, sometimes to raise money for a specific cause. Often performances were given in the Village Hall. An old pupil at school in 1926 (now  living in the USA and returned on a holiday to visit her sister) told me that the children performed a play called "A Blade of Grass" at Lane End. This was a concert arranged by the Bucks. Education Authority as a joint effort by schools in the surrounding villages. Certainly during WWI some parents organised a May Day Garlanding to collect money for comforts for the troops. Possibly Mr & Mrs Derry considered "Maying" as a "heathen" custom. During Mr Derry's time as headmaster the school numbers dropped from 111 in 1906 to 50 in 1928. This must have been somewhat depressing for him as the decline was remarked upon in the yearly reports, but was due to circumstances beyond his control. 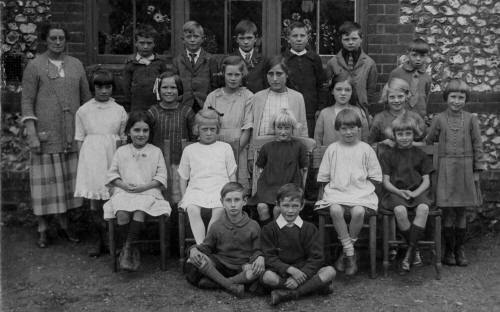 Firstly, Skirmett Infants School was closed shortly after WW1. Skirmett parents chose to send their little ones to Turville school, a much easier, level walk and many of the older Skirmett children accompanied them. Some parents chose Hambleden School as the public bus service ran via Skirmett to Hambleden. Secondly, the birth rate dropped all over the country and thirdly, there was a drift away from farming to better paid work in urban areas. Judging by the entries in the Log Book, Mr Derry made several attempts to secure another post, but either failed to do so or did not like the schools he was offered. By this time scales of pay were established countrywide, but Bucks was on the lowest pay scales. Neither Mr nor Mrs Derry seem to have enjoyed the best of health. In fact Mrs Derry had long periods of absence, e.g. Supply teachers came and went during these periods of illness, inevitably this added to the workload of the headmaster. 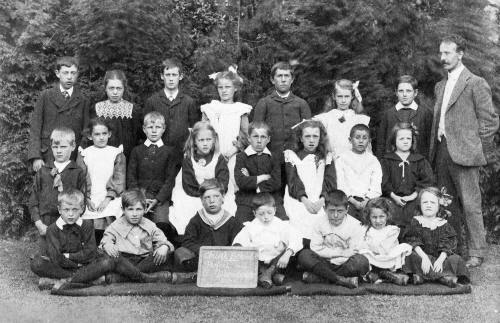 From 1903 to 1925 Miss Elizabeth Barksfield, who had first been a Monitress and then a Supplementary Teacher, took the infants class. She seems to have been well thought of and became a good teacher, trained and guided by three successive headmasters and two of their wives. The school curriculum remained much the same as before, except that facilities for pupils over 11 years were improved. Light woodwork was introduced in 1910 and, as the number of pupils dropped in the post war years, the south end of the third room, partitioned to make two classrooms, was used as a woodwork room (Note 23) At one period the older boys had small plots of garden to cultivate. Needlework for the girls appears to have reached a high standard, and good reports were received after each yearly visit from the Needlework Advisor. 1910 : The Village Hall was used for dancing lessons, play rehearsals etc. The Log book does not record when the system of leaving by passing the 'Labour Exam' ended, but mentions pupils taking it in 1913 and 1917 when they had to go to Marlow for an examination. Soon after this date pupils could only leave at the end of the term in which their 14th birthday occurred. In 1914 the Log Book records a case of a parent who altered a birth certificate to make it look as though her son was 14 and not 13 and was taken to court at Marlow for doing so. Instances of children being kept at home to help (Note 27), or of truanting, are less frequent. 1915 : Two boys came too late to be marked this pm having gone cow minding on the Common. 1907 : Talk on "The Band of Hope" (Temperance). 1913 : 11 children went to Fingest (Note 28) to have their teeth attended to. 1915 : School Oculist visited the school and examined the children. School closed for 10 weeks, including the Summer holidays, due to an outbreak of Measles. 1916 : Children went for adenoid and tonsil operations at Marlow Hospital. Measles and Whooping Cough cases in school. School closed by an outbreak of Diphtheria. 1923 : Still no provision for physically or mentally handicapped children, the latter were retained in school until certified. School closed for an outbreak of Measles and Chickenpox. 1929 : Outbreak of Scarlet Fever in Skirmett, children excluded. The school was closed for epidemics of infectious diseases or when the percentage attendance was low due to bad weather. As stated previously, the school roll fell during these years. No new building was added after 1905, but the HMIs' yearly reports pointed out defects in the building which should be remedied. 1907 : The ventilation of the larger classroom is unsatisfactory. The condition of the two small playgrounds (Note 31) is not at all satisfactory, their rough surfaces are quite unsuitable for Physical Drill. 1908 : I am glad to find that an efficient system of ventilation has been installed (Note 32) in the classroom complained of last year. The provision of suitable playground space (Note 33) appears as far off as ever, and yet the necessity is most urgent. It is not right, nor safe, that the children should be compelled to play in the high road. The larger classroom needs a glass and wood partition (Note 34) if teaching is to be carried out with comfort and full effect. The curtain now in use is of no value whatsoever. 1915 : The lighting is by no means ideal at the west end of the main room and in the Infant Room the sill (Note 36) of the south window should be lowered. The 'offices' were far from clean. 1927 : Exterior of the school repainted and the roof repaired. Mr Derry does not mention the outbreak of war in his log book. "The War that would be over by Christmas" but which dragged on for four years. As the war progressed one feels the depression caused by bereavement and suffering. Mr Derry kept a "Roll of Honour". This was a sheet on which was recorded the names and regiments of all Frieth scholars and residents he knew of who had "joined up". A pencil cross beside a name indicates loss of life. 9th -19th Sept : Military manoeuvres on a large scale have been taking place all around the neighbourhood. Empire Day : Sang "Flag of Britain". Ceremony of Saluting the Flag. Lessons given on saving food, especially bread. Blackberry picking. Six afternoons. 674 lbs picked. During the Christmas holidays he died. Then followed four months of supply teachers until Mrs Derry took the post of Headmistress in April 1928. 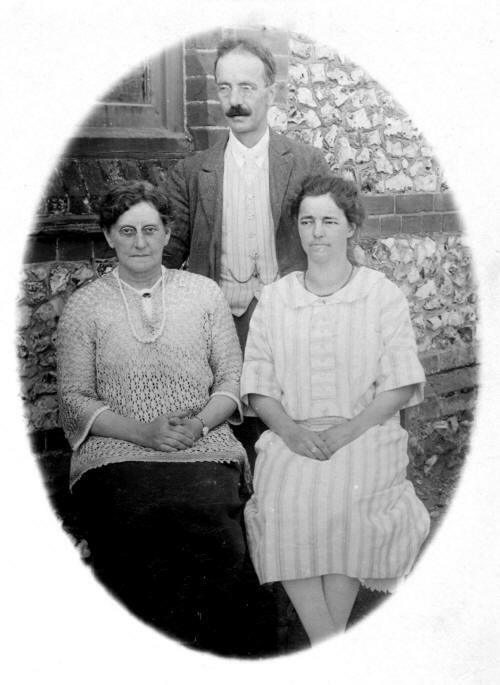 Mrs Derry carried on the School much as her late husband had done until she retired in July 1930. Click to go on to the next chapter "Mrs. Hinton 1931 - 1941"
Comments in [ square brackets ] are mine or contributed by others, the rest is my mother's original text. (21) A group of older boys were punished for a misdemeanour - one of them retaliated by throwing a stone through a school house window! 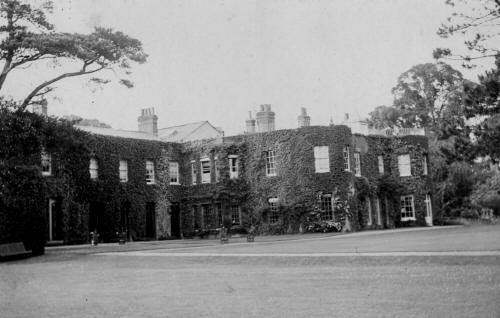 [ (21a) Derek Collier contributes a reminiscence of his father, recorded about 25 years ago, who was a pupil at the school during Mr Derry's time : "Mr. Derry was a very cruel man and would often thrash the living daylights out of the children with a hazel stick which had been cut from a hedge by one of his favoured boys. He would take the children to the front of the class and jump up in the air when thrashing them just to get extra height to his swing. He would lift the girls skirts up so it would hurt more"
(25) They were still in use in 1950! (27) The attendance figures were often low and this was blamed on illness. However the School Attendance Officer had been, and still was, very active and parents had been fined for keeping children away to help at home - doubtless a convenient 'cold' served as a good (and permissible) excuse for minding the baby. (30) This accounts for the window in the south wall of the Infants Room being so high up. (31) At the time there were two small playgrounds, at the rear and in front, enclosed by iron railings. However the children were allowed to play on the Village Green, where they wore a patch bare of grass, which was muddy in winter and dusty and stony in summer. (36) In 1985 the sill has still not been lowered! 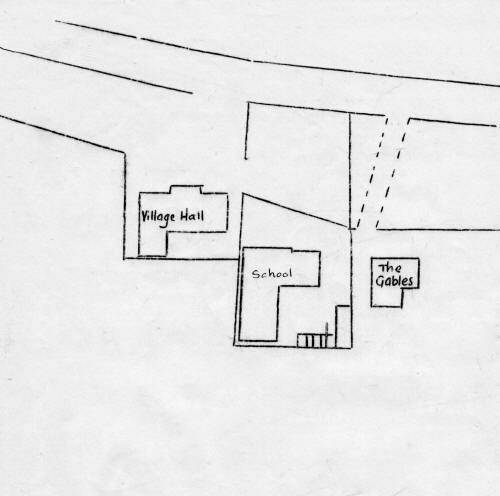 (39) The scavenger emptied the bucket lavatories into a pit at the rear of the school by the allotments.